So you think you know tap? You’ve watched tap on Ed Sullivan, or Broadway, or tapes of Bojangles Robinson or the Nicholas Brothers, or maybe you’ve seen Savion Glover live, and you think you know tap? Maybe you’ve even seen Dorrance Dance once or twice, and you think you know tap? You know nothing, Jon Q. Audience. Tap’s game of tones has just begun. 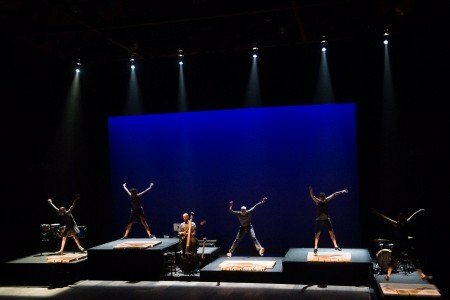 Dorrance Dance began a weeklong engagement at the Joyce Theater with an eye-opening, and ear-opening, exhibition of tap dancing that did more than just take your breath away with the dancer’s’ skill. It also introduced a method of tap-initiated-music: not just the percussive sound made by tap shoes, which by itself is a kind of music, but the sound of music created when shoes (or fingers, or other limbs), meet pre-programed sounds in real time. The multi-faceted program, titled ETM: Double Down, is an entertainment, an experiment, and a tap history lesson of sorts. That it ultimately was not as successful as it might have been is not really significant here. It was highly successful as entertainment, and it represented a clarion call to tap’s future – or at least one aspect of it. In detailed program notes, Michelle Dorrance, the company’s founder and artistic director, and her primary collaborator on this effort, Nicholas Van Young, explain the genesis of the piece. Essentially, what they have attempted here is not only to work with the amplified (or not) sound of tap shoes against the stage floor or an elevated wooden board to capture (perhaps with the aid of mini-microphones) the crisp percussive sounds made on contact by the tap shoes themselves, but to connect the boards to a computer program such that the contact triggers the sounds, with variable intensity, created by drums, chimes, and other instruments. I don’t know if I’ve explained that correctly (I’m not a techie, which is an understatement of the highest order) – essentially the boards become instruments triggered by, and controlled by, contact. Into the mix Dorrance and Young add sampling and looping. Sounds are created, recorded, than more sound created and recorded to overlap them, resulting in multiple concurrent sound layers. Nothing new here. However, doing it on the fly, in this context, creates an extraordinary visual, as well as aural, effect. Unfortunately, the program notes don’t define “ETM”. While the acronym has many potential definitions, it appears to be an abbreviation for “electronic tap music” (In his program notes, Young uses the acronym EDM, electronic dance music, as something he has previously worked with, so I’m taking my definition from that.) But I suppose Dorrance and Young will clarify that as the process evolves. ETM: Double Down is divided into two Acts, with the second incorporating vocal sounds lusciously delivered by Aaron Marcellus (who layered his own sounds during the presentation), and more electric – as in exciting – movement. Each Act is divided, sometimes loosely, sometimes not, into separate dances (or ‘scenes’ within them) that explore a particular technical issue. It must be emphasized, however, that this is not an effort to show how impossibly fast feet can move, or how loud the sound produced can get, or to show off (though some amount of all those qualities is inevitable). This was creating a new form of tap dance art. This was also an experiment. A laudable one, but much of it, particularly at the beginning of each Act, looked like an attempt to educate the audience by demonstrating what these ‘new instruments’ could do in the context of a tap dance presentation, but perhaps that’s because I was paying too much attention to the ‘how’ of what was going on. Although it was conceived, apparently in large part, as improvisation, by the time it hit the stage it looked programmed, structured, and well-rehearsed – which is a compliment, not a criticism. The dancers are an extraordinary group – aside from Dorrance and Young, they include Elizabeth Burke, Warren Craft, Leonardo Sandoval, Caleb Teicher, Byron Tittle, Carson Murphy, and Gabe Winns. Gregory Richardson (on bass and guitar), Donovan Dorrance (on piano), and Young, with Craft and Ms. Dorrance (on percussion), accompanying the sounds that the dancers themselves made. The cast also included Ephrat “Bounce” Asherie. Asherie is a New York based dancer and choreographer with an impressive performance background, including as a bgirl (a bgirl is female performer of a type of street dance known as breaking). Here she was used primarily for her breakdancing ability. She moved with phenomenal skill, and came close to stealing the entire performance. 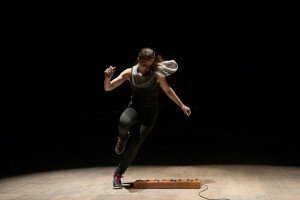 Though largely presented in featured solos that were to a greater or lesser extent integrated into the overall piece, Asherie’s performance elevated breakdancing to a concert art form of its own. And the part of Act II in which she and (primarily) Dorrance interacted with an ‘instrument’ (not something that was activated by pressure, but something that when you pushed a button played a pre-recorded music sample) (I said I wasn’t a techie) was sensational. That having been said, I have concerns about the reason given for including Asherie’s dancing (at least this form of it) in the piece. 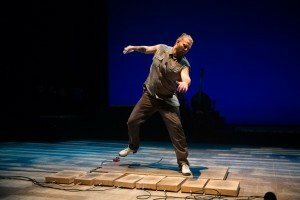 As implied in Dorrance’s program notes, it was to illustrate two different prongs of street dance, with tap being “deeply rooted in the foundations of Hip Hop and House dance” – which is a way of saying that tap and hip hop have the same roots. I concede that I’m not a tap dance historian, but from what I’ve read, that may be overstating things – hip hop and tap may, in one sense, have similar foundations, but tap preceded it, and tap also has roots in other forms of percussive dance that have no relationship to hip hop. 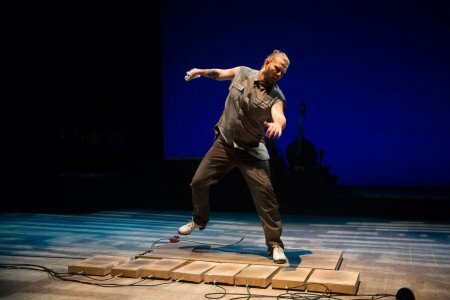 In any event, even ignoring the purported historical connection, having both tap and breakdance integrated (sort of) into ETM: Double Down enhanced the presentation simply because of the skills of the artists involved – including Dorrance’s ability to pull things together in a way that makes it all coherent. My other concern relates more fundamentally to the art form that Dorrance and Young are attempting to create and nurture. Early on, as I was watching the tapping trigger non-tap-like musical sounds, it appeared to me that, as presented, this was not much more than what a xylophone would accomplish. And sure enough, toward the end of the program, one of the musician/dancers ‘tapped’ on the ‘board instruments’ with mallet-like objects to produce sound, as would be done with a xylophone. If the novelty of having tapping provide the effect of a xylophone (or drums, or chimes…) is all there is, then why bother? I don’t doubt, however, that Dorrance Dance will continue to develop ETM, and that over time it will look less experimental and educational, and more like a new entertainment form – not just to make unexpected tap sounds or to see the music, but to be the music. I can envision, eventually, a tap concerto or chamber symphony. I suspect that Dorrance and Young can as well.